In recent years candy buffet tables are showing up everywhere! Parties, showers, receptions, and so much more. If you are considering having a candy buffet table at your wedding reception it is truly a good idea. Making a buffet table requires skill and a profound eye for detail. You can make one yourself, but with all the wedding planning you have ahead, it's best to hire a professional candy buffet maker. This guide was designed to help you find the right candy table maker to fit your needs, and also help you get involved with the process. Planning in advance is key. Your wedding theme may suggest the colors you choose for your table, if that is not the case start considering color schemes. The market for candy buffet makers is a small one. With that being said they often get booked for weeks to months at a time. It is important that you give them enough time. You should hire a maker at least two months in advance. The best way to find a maker is through word of mouth. Ask friends, family, and co-workers who have had a table who they hires. Ask them if they were satisfied or not. Look online for makers near you. Look on the internet for ideas. 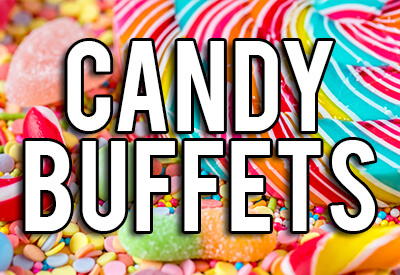 If you simply type “candy buffet table” into a search engine you should have thousands of pictures to scroll through. Print out some of your favorites. Bring these along when you visit with makers to see if they can execute your wishes, if not, move on. Once you have decided upon a color scheme, start thinking of the small things you would like to incorporate. It's a good idea to include a center piece on your buffet, one of the same center pieces you use at your reception tables. It ties the rest of the reception into your table. You can also think about using candles. Candles illuminate your table and bring attention to it, they also offer a beautiful ambiance to the buffet. Consider if you would like to provide your own containers, or will the maker provide them. Just like everything in wedding planning, create a budget and be sure the maker has a clear understanding and your come up with a mutual agreement. Ask to see their portfolios of past events they have done. You should determine the location of your table. You could put it off to the back accessible by only one side, or place it in an open area accessible by all four sides of the table. That will eliminate long lines at the table. You or the maker should provide baggies, or small boxes to place they candy in. you can include small thank you notes in each bag or box. Candy buffet tables make great goodie bags, and is an inexpensive way of saying thank you for attending. It can also save you money on having to send out that you cards after your wedding. Having a candy buffet table is a fantastic affordable idea. They are great for wedding receptions. They will really give your reception an extra piece of beauty. If your thinking of hiring a candy buffet maker Atlanta has various options for you to choose from. Go check them out!